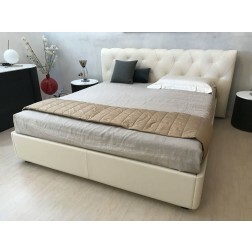 Lago Fluttua bed for 160x200 cm mattress with white faux leather 01 headboard. Fluttua is a bed that seems suspended thanks to the single central leg adjustable in height. The head is hooked to the wall by means of dowels. It is an essential bed that gives shape to the lightness of dreams and emotion. Included in the price n. 2 bedside tables L. 55 x 40 x h. 18 cm. and n.1 suspended chest of drawers L. 110.4 x 40 x h. 36.8 cm. with glass top. Mattress size: 160 x 200 cm.